What is it about old photographs that make them so fascinating? I think part of the answer lies in our natural curiosity about the past. What did things look like back then? And to a student of archaeology, old photographs of archaeological sites can be especially fascinating because it raises the question: What did things look like when the first archaeologists stepped onto the scene? Our picture of the week comes from Volume 4 of The American Colony and Eric Matson Collection, which focuses on Lebanon, Syria, and Jordan. 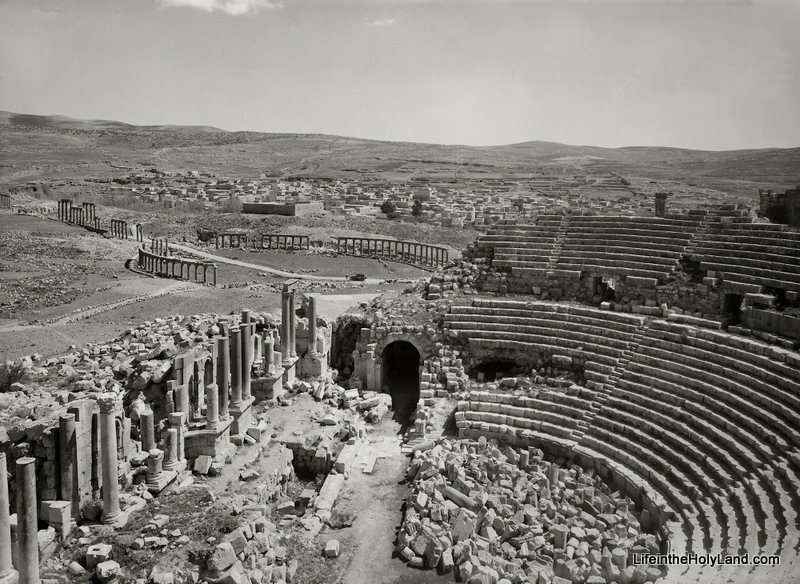 In the photo below, you can see the southern theater and the forum at Gerasa (a.k.a., Jerash) in the modern country of Jordan. Gerasa was one of the cities of the Decapolis, and "the country of the Gerasenes" is mentioned in Mark 5:1, Luke 8:26, and Luke 8:37. The photo was taken sometime between 1920 and 1933. Another early photograph of the forum can be found here on LifeintheHolyLand.com. By way of contrast, this page on BiblePlaces.com shows you what Gerasa looks like today, after the archaeologists have excavated, cleaned up, and reconstructed these ruins. The differences between then and now are striking. For the archaeologist, this collection provides photographs of early digs and of sites as they looked before excavations. For better or worse, this was an age when a lone scholar stood over a team of local workers who moved tons of dirt in a single season (and this practice can be seen in the collection). Yet this was also a period when things were fresh and exciting as archaeologists were digging into sites for the first time. For the preacher and teacher, this collection provides additional material which can be used to transport your listeners back to a culture and landscape similar to biblical times. It also can be used to discuss geography or illustrate particular sites. For the historian, this collection provides windows into this dramatic period of history. This was the period of the late Ottoman Empire and the British Mandate when Jewish immigrants were migrating to Palestine and establishing new settlements. It was also a time when technology was on the rise: electric stations and telephone stations were being built, railroads were being constructed, and automobiles and airplanes were coming onto the scene. For the artist and graphic designer, this collection provides many beautiful, crisp, black & white photos of places in the Holy Land that can be used in a variety of ways. These photos still capture people's attention and fire their imaginations. This photograph and over 700 others are available in Volume 4 of The American Colony and Eric Matson Collection and can be purchased here for $20 (with free shipping). 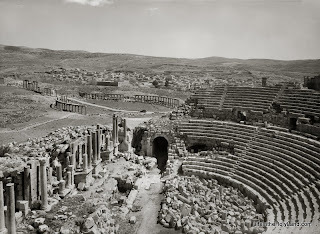 Historic images of other Roman cities can be seen here, here, and here on LifeintheHolyLand.com. Q&A: Did Herod Plant Sycamores in Jericho?